Hills, forest, ocean, beaches and Gothic Revival architecture. It's a magical combination that urges you to get outdoors at every opportunity. When the original Scottish settlers laid eyes on Dunedin in the 1840s, they had grand plans. They set about creating an architecturally-splendid city that would show the northern hemisphere a thing or two about urban design. To appreciate the historic beauty of the city, we recommend urban hikes in and around the CBD, including the popular street art trail. Framing the city is a choice of remarkable landscapes that are perfect for adventuring – ocean beaches, a huge harbour, forested mountains and the splendid Otago Peninsula. Head in a new direction each day to discover refreshing outdoor experiences. A quick bus ride from the Dunedin's city centre is St Clair Beach, a gorgeous stretch of white sand with one of the most reliable surf breaks in the country. You can swim here in summer (though it's a little brisk without a wetsuit) or you can get wet the relaxing way at the hot saltwater pools. You'll literally be soaking up history, because the pool was first built in the late 1800s. With waves crashing on the sea wall and gulls circling overhead, it's almost like you're in the ocean. Before or after, you can walk the beach or enjoy a meal at one of the seaside restaurants. 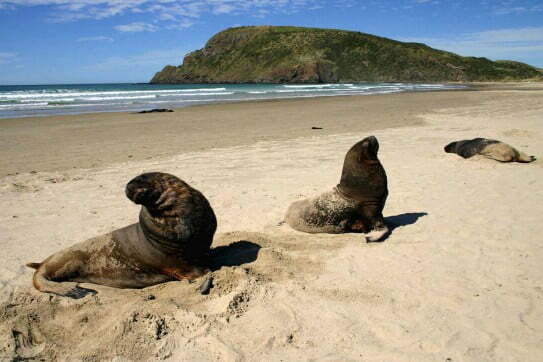 Another magnificent Dunedin beach is Brighton, 20 kilometres from the city centre. It's a beautiful drive and the beach has everything you need for a day at the seaside – white sand, sheltered swimming and interesting rock pools. Two of New Zealand's most famous creatives were inspired by Brighton Beach – James K Baxter the poet and Colin McCahon the painter. Pack your favourite hiking shoes for your trip to Dunedin, because there are some blockbuster walks in the region. Begin with the Mount Cargill track behind the city, which delivers huge views of the hills, city and harbour. There's also a skyline walking route known as the Pineapple Track – you'll need half a day for this adventure, but it will be worth it. 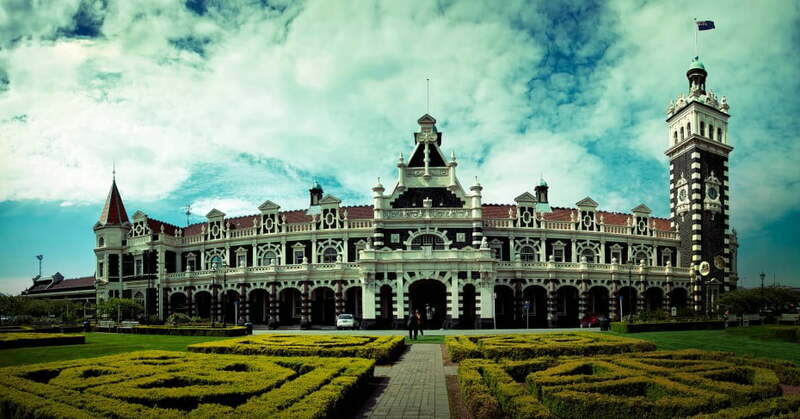 To explore the inner-city area, consider a Dunedin walking tour led by a knowledgeable local. Glenfalloch Woodland Garden – 12 hectares of pathways, big trees, water features and exquisitely landscaped gardens. The Tomahawk Lagoon track, which is signposted from the picnic area at the top of Tomahawk Lagoon. It climbs to Soldiers' Monument and delivers huge coastal views. The Pyramids and Victory Beach track, for natural wonders, a beautifully wild beach and the possibility of seeing yellow-eyed penguins, fur seals and sea lions. Lovers Leap and The Chasm, an easy walk to dramatic cliffs, massive coastal views and a sea arch known as Lovers Leap. Directly in front of the arch is The Chasm. Sandfly Bay, for photogenic cliffs, sand dunes and surging waves. 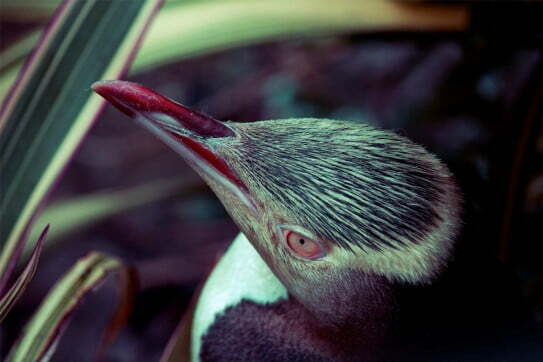 Near the southern end of the beach a track leads up to a hide to view yellow-eyed penguins. You might also see sea lions (stay 10 metres away at all times). Dunedin's hills have bred a mad-keen mountain biking culture, so if you like to shred the dirt you'll find plenty of company. There's an easy Dunedin bike trail in Jubilee Park, right in the heart of the city between Māori Road and Serpentine Avenue. A little further out is Redwoods/Wakari Creek – a mix of easy, moderate and advanced mountain biking tracks, some with skills obstacles. Another venue is Bethunes Gully/Forrester Park near Mount Cargill. In summer and autumn, Dunedin's twilight time extends biking time into the evening. The sun doesn't set until 9.30 at night in January! You don't have to be a mountain biker to enjoy the best of Dunedin cycling. The city has a network of dedicated cycle lanes and paths, so you can easily get around on two wheels. The most scenic riding can be found around the harbour's edge. You can ride to Aramoana via Port Chalmers or follow the edge of the Otago Peninsula to Taiaroa Head. Of course, the ultimate biking adventure in this neck of the woods is the Otago Central Rail Trail, a five-day off-road journey between Middlemarch and Clyde in Central Otago. You can catch the Taieri Gorge Railway to Middlemarch from Dunedin, then pick up your bikes and get going. Accommodation along the way should be booked before you head off though, because the trail can get busy during summer months. Railway Station image courtesy of Enterprise Dunedin; Penguin image courtesy of Enterprise Dunedin; Otago Peninsula cyclists image courtesy of Enterprise Dunedin.